Several times a year, you might not catch Greg or Paige Kemp when you call Kemp’s Flooring. If your message is urgent, you’ll need to travel down to the Baja peninsula of Mexico, and in particular, the tiny town of San Quintin, where you’ll find them helping the poor. 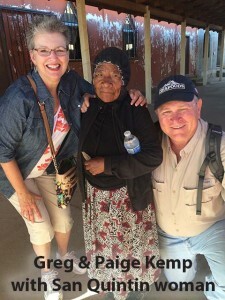 As members of the Mayfair Church of Christ, the Kemps have been doing mission trips since their daughter was in high school. It started out as a spring break service trip. From building homes, repairing roofs and building churches, to serving meals and meeting the medical needs of this impoverished community, the Kemps never feel as though their work there is done. The residents there are mostly field workers, either planting or picking strawberries six-and-a-half days a week. While there, Greg and Paige focus on problem solving, purchasing supplies, and driving the volunteers to and from the areas where they’re needed. Greg admits he doesn’t add value to the actual construction side of the work done there. One particular story of the human condition has stayed with the Kemps. A woman named Sylvia had three children. She was so poor, she had no choice but to put her children in the care of the City of Children orphanage in Ensenada. Sylvia was allowed to visit her son and two daughters one Sunday a month, always bringing them her delicious, homemade food. Word soon spread of Sylvia’s excellent cooking, and she was offered a full-time position at the orphanage, which was the happy ending to a very sad situation. Today, her two daughters are happily married, and her son Misha works full time as a leader at the City of Children. “It’s inspiring how God works and how people can overcome these horrible circumstances,” Greg mused. Thanks to Misha’s ongoing relationship with the Kemps and other Auburn fans, he also has become an enthusiastic Auburn fan and has traveled to the U.S. to attend football games. 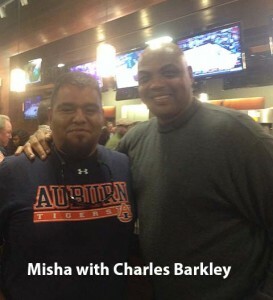 This past November, the Kemps took him to a basketball game, where they happened to run into the very gracious Charles Barkley, who posed for a photo with Misha. “For this kid from a Mexican orphanage to be standing there with his arm around Charles Barkley was really cool,” marveled Greg. Misha’s story has a particular resonance for Greg, whose own grandmother lost her mother at an early age. Her father was a poor dirt farmer, and he was forced to give up his four daughters to a wealthier family, who essentially used the girls as indentured servants. “It wasn’t until my grandmother finally married that she was able to leave the family she was given to,” Greg explained. He notes the similarities between the people of two cultures thousands of miles apart are striking. During Greg and Paige’s first visit to Mexico, Greg donated his red and khaki jacket. Years later, he attended church on a Sunday night and was surprised to see his jacket again, this time, on a man at church—a man whose name was Gregorio. In the future, the Kemps hope to focus on expanding educational opportunities in San Quintin, as they’ve noticed the children who do get educated there tend to leave for work in Tijuana or San Diego. The Kemps hope the children they help educate in the future will sustain their faith in God and remain in the area to benefit their homeland. If you are interested in helping with the mission trips, please contact Kemp’s Flooring at (256) 830-5969 or contact the Mayfair Church of Christ at (256) 881-4651 or visit http://mayfair.org.